Lesson # 471: Never volunteer for anything. If you wait long enough, someone else - like your older brother - will do it for you. 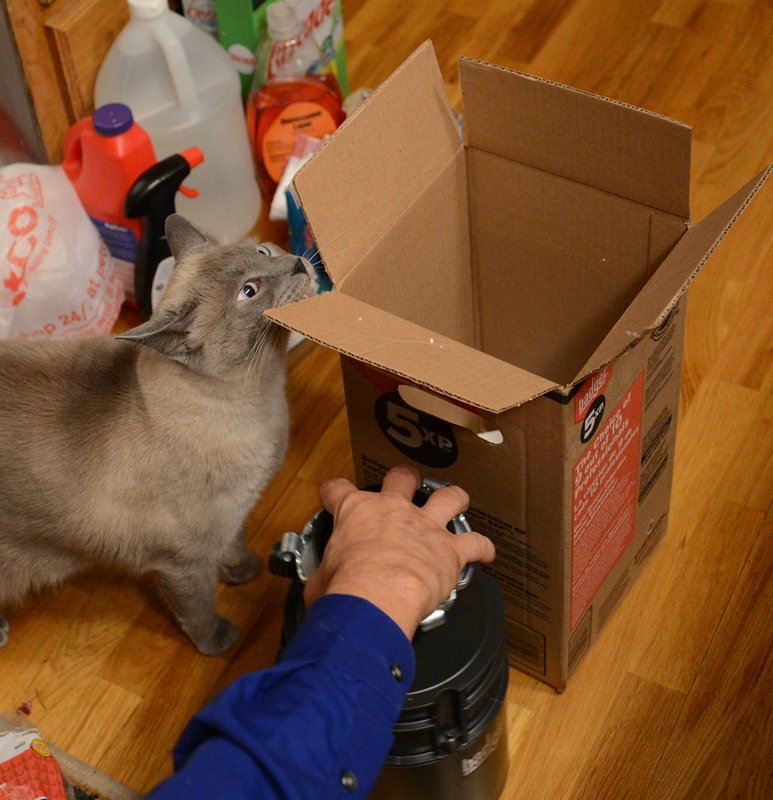 Maxwell: "Need any help with that garbage disposer, Papa?" "Here, I'll hold the box still while you lift all the parts out." "Yup, right size. Let me just make sure this ring's on tight...."
"More parts in the bottom? Need me to go get them, Papa?" "Uhhngghh, I'll...just be a minute...almost got it..."
Oh Maxwell, I sure could use you around my house! Do you hire out? OMG - Faraday...you let Maxwell have a perfectly lovely box???? Maxwell is a very good boy! Faraday, you might want to take some lessons from him, right? I would never let Lizzy occupy a purrrrrrrrrfect box like that. Efurything new is mine first. Aaaaaw How adowable. Luvved it. 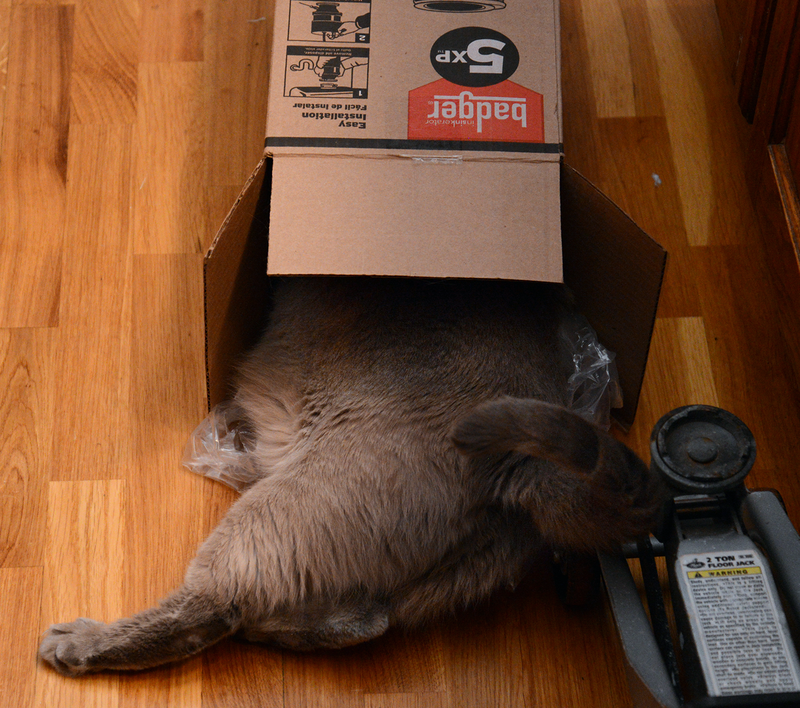 Faraday, maybe that was just his clever way of getting to the box first..
We know you were a big help to your Papa!! But... but... I thought that looked like fun! Faraday: Summer, totes! I mean, the BOX is fun and all, but doing WORK? 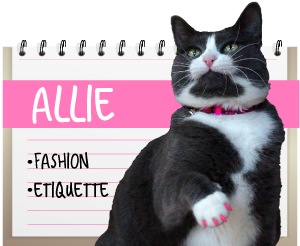 Ewww, I'm allergic! Dude you got it sussed. Have a fabulous Friday. Being so helpful is what we do! 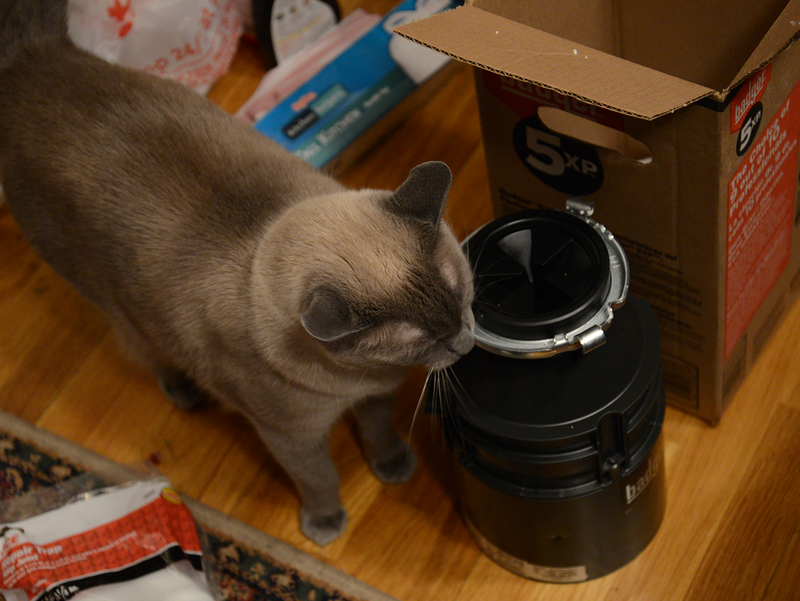 You are very helpful Maxwell. Good job pal. What would your human ever do without your help. I'm sure if you wouldn't have snoopervised, that ring would not have sealed, and there would have been water everywhere! 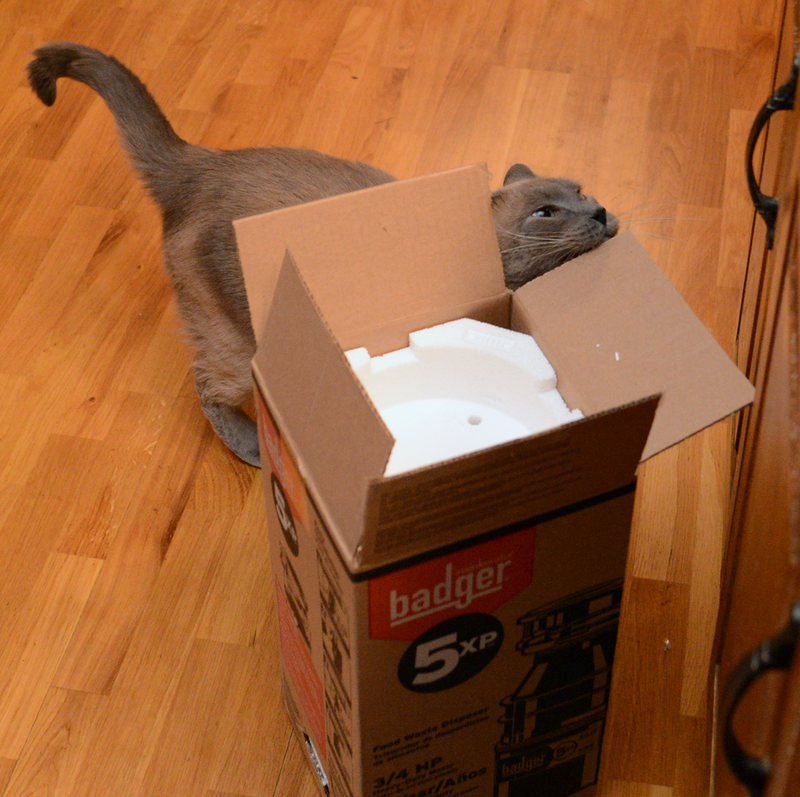 You were just waiting for that box, right, Faraday?? Ecellent! 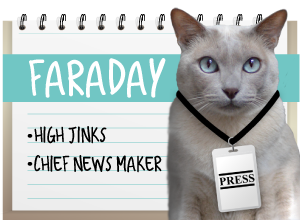 Now Farady, mes has something mes needs help with, how does one stop a bratty young cat, mes shant name names, but it sounds like Ninja, fromk attacking yous when yous is trying to use the litter box? Thanks in advance Farady, mes needs all the help mes can gets! Wow, TBT had ta do that last year and we didnt help him at all! Good werk! We need to get you a tool belt, Maxwell. ... just don't start wearing those low-riding pants. What should your dad-person do without your help ?! I hope you got extra treats for being a star??! 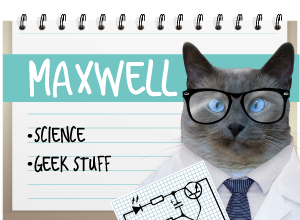 Maxwell is a huge help! Bet your Daddy really appreciated it too!